Showerheads fall into five general categories. Many have some adjustable features that let you select the spray pattern and the intensity of the jets. Single-head spray showerheads are the familiar adjustable nozzles that have been rinsing our collective bods for decades. Single-heads feature four or more individual nozzles that distribute the spray in patterns. The nozzles adjust with a small lever that changes the flow pattern from wide spray to concentrated streams. 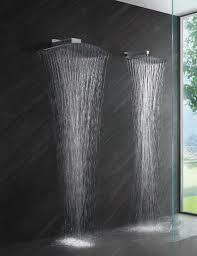 Rain showers are large, flat heads that are suspended directly above the user and direct the spray straight down. Dual and multiple showerheads feature more than one showerhead controlled by a single set of levers/handles. A typical configuration is a fixed, wall-mounted showerhead paired with a handheld counterpart. 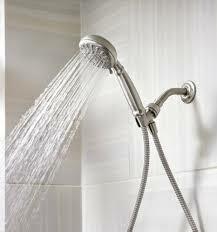 In some instances, a diverter valve allows the user to operate either showerhead or both simultaneously. Hand-held showerheads feature a single head sprayer attached to a flexible hose, good for washing hair and those hard-to-reach places. Hand-held showerheads are particularly useful for those with limited mobility, and those who might shower in a sitting position. 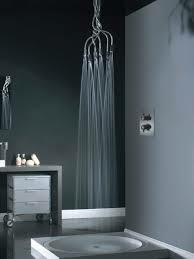 Body sprays have multiple spray heads integrated into the shower wall. The heads themselves are either compact nozzles, or are flat and nearly flush to the wall surfaces. The possible configurations are limited only by your imagination and your home’s water pressure. Showerheads, handles and valve controls come in a many finishes including polished chrome, brushed chrome, polished nickel, brushed nickel, hammered nickel, stainless steel, bronze, brushed bronze, oil-rubbed bronze, polished brass, black and white. If a consistent look for your bathroom finishes is important to you, select all your bath fixtures, faucets and accessories from the same manufacturer. Remember that polished finishes are elegant but require constant upkeep to keep them looking bright and free from spots. Brushed and matte finishes are better at hiding water spots and fingerprints. Shower valves are very important; you can’t see them, but they are the piece that is responsible for regulating water pressure and temperature. Valves are important, and therefore, it is important that you have a basic understanding of valves so that you can choose the right one. Mixing valve: This is the basic device that mixes hot and cold water. When you twist your temperature control lever to make your water hotter or colder, you’re adjusting your mixing valve. Pressure balance valve: This miracle worker keeps water temperature constant by adjusting the pressure of your hot and cold water inflow. That way, you won’t be surprised when the washing machine comes on and steals your hot water pressure. It’s also called an anti scald valve, and it’s an especially good safety feature for small kids or senior citizens. A drawback is that it maintains constant temps by altering pressure, so the overall flow rate of the water may fluctuate. Anti scald pressure balance valve: These valves are required in new home construction. In older homes, however, installing a pressure balance valve may invite problems; clogged and corroded pipes may reduce pressure to the point that the valve won’t do its job properly. 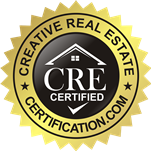 If you suspect problems, contact a licensed plumber to evaluate your pressure. Thermostatic valve: This is a more sophisticated version of a pressure-balance valve. It maintains constant temperature but, unlike the traditional pressure balance valve, the thermostatic version maintains constant pressure. You’ll pay about twice as much for a thermostatic valve as a simple pressure balance valve. Steam showers come as complete pre-fabricated shower units with special doors that help seal in steam or as separate components that can be installed in a custom shower stall. The soul of the steam shower is a relatively small generator that turns water into steam, then pipes it into the shower enclosure. A retrofit project means finding a location for the generator; typically a nearby closet or cabinet. Digital controls. Get a multi-sensory experience at the touch of a button. Program your shower controls to regulate flow intensity, temperature, ambient lighting and music from your private collection. 2 Comments on "Having Trouble Selecting Your Showerhead? Join the Club. Here is More Information to Help You Decide"
We’ve definitely saved on our water bill since switching shower heads. We’re in a rental. The one that the landlord had there when we moved in was a very, very old one. I’d say it cut our bill down by about 5% every month, which is significant in my opinion, considering that was 5% of money wasted before we switched the shower head. Awesome! 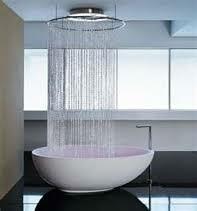 Great article, I had no idea that you could save money on the water bill by switching out the shower head. I’ll have to check out some manufacturer reviews online.